Many kids won't venture outdoors to play alone, but if you're offering to play with them, things suddenly look a whole lot different. Make it a priority to give your kids the one-on-one attention that only play-time can provide. Shelve that to-do list, put on your pirate hat and have some fun with your kids. Your kids will enjoy having a friend or two over to enjoy outside play, especially when back-to-school seems so far away. Make the day special by planning a simple backyard picnic and providing some new outdoor toys just for the occasion. A wooden play structure provides plenty of areas to create cozy reading nooks. Provide quilts, cold drinks, and healthy snacks to make the area even more appealing. Not sure what to read? Enroll in your library's summer reading program for help finding some fantastic literary adventures for the long summer days ahead. For even more fun, read a chapter book aloud with the entire family. 4. Invest in a backyard play structure. 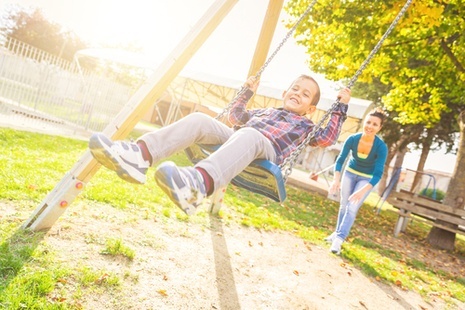 You don't need to live next to a park to give your kids access to a first-rate play structure. The Backyard Adventures Series of play structures come in a variety of sizes and configurations perfect for any yard and family size. Do your kids need some motivation to get outside this summer? Surprise them with a Backyard Adventures Play Structure. Contact us at Idaho Outdoor Solutions to start making memories today!